-Yamato sewing head exclusive designed for Vi.Be.Mac. -Directional forced air device, not required any hand touch by the operator during the operation. 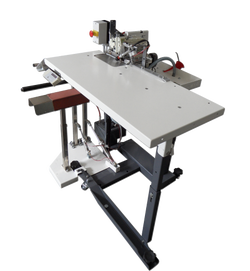 Developed with the latest technical solutions, this unit guarantees super high sewing performances, flexibility and an incredible stitching quality, besides long lasting life of its parts and components. The innovative and PATENTED air-assisted transport system allows to stitch ANY kind of fabric, from light to heavy, stretch or double stretch, besides being the first and the only serging unit which can sew on the back panel with the back yoke already joint, thanks to our automatic and PATENTED back yoke joint detector! The V800 AS presents amazing and patented new solutions based on our statement "BUILT TO LAST” or rather: 4 lt extra oil, forced oil device with inter cooler pump (patented), 100% cut scraps vacuum device, special cutting system device with HSS blades (patented) provided with vacuum and sensor which allow the machine to work continuously, long lasting blade +50% and threads saving over +70% . An extra Pneumatic cylinder assists the cutting device. As much as all the Vi.Be.Mac. units, our technicians put special consideration towards the operator's comfort, that's why the stand is adjustable in height and equipped with wheels to make any movements inside the production lines easier. Same for our internal stacker, safe in use and space saving. Furthermore, whenever maintenance operations need to be done, the sliding upper table allows the operator to completely open it, making any operation a kid's stuff! Forget about the manual side seam operation with its huge problems of low productivity and poor manual quality results, just switch to automation with the V800AS and get the best output possible in terms of both quality and quantity!